An Asteroid and Two Comets, Oh Boy! 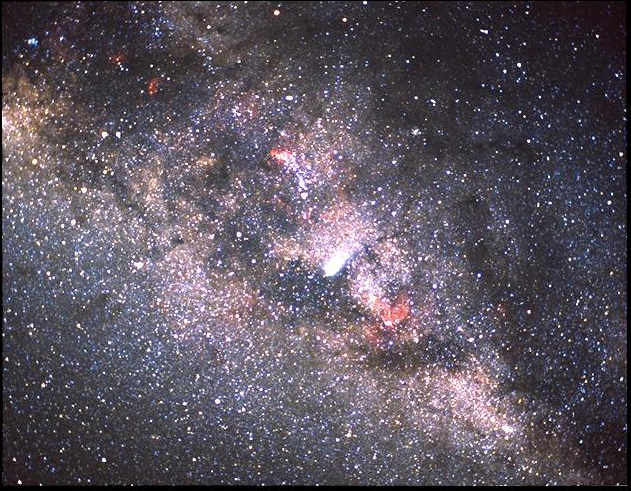 Picture of Halley’s Comet against the Milky Way in 1986. Courtesy of NASA and the Kuiper Airborne Observatory. 2013 is shaping up to be a very interesting year astronomically. This coming Friday there is an extremely close (about two Earth diameters) fly-by of an asteroid: DA-14. This asteroid will make the closest pass of any object of its size known to science in recent history. Prior to the last 25 years or so, astronomers did not have the optical capability to find such objects. This object is similar in size to the asteroid that caused the Tunguska event in 1908 which leveled thousands of square miles of forest in Siberia. As to DA-14 hitting the Earth, I advise checking out this NASA video: http://www.space.com/19432-close-approach-of-asteroid-2012-da14-fear-vs-fact-video.html. I hope NASA is correct in their calculations! I think they are. In March Comet Pan STARRS will be making its debut from out of the Oort cloud and starting in October astronomers expect Comet ISON to put on quite a show for Northern Hemisphere viewers. The first thing that is interesting about all three of these objects is that they were unknown to mankind until recently. Asteroid DA-14 was discovered by astronomers in Spain in February 24, 2012, Comet Pan STARRS was discovered on June 6, 2011 by astronomers in Hawaii at the Panoramic Survey Telescope & Rapid Response System (STARRS), and Comet ISON (International Scientific Optical Network- the name of the Russian group making the discovery) was discovered on 21 September 2012 by Vitali Nevski and Artyom Novichonok in Russia. In past years many comets were known to come back into the inner solar system at periodic intervals. Probably the most famous of these comets is Halley’s Comet which has whizzed past the Sun every 76 years. It may not make the same splash anymore since the Sun vaporizes some of the gases in each flyby of our star (most recently 1986) and the comet has been getting dimmer. Comets are on severe elliptical orbits around the Sun and Halley’s Comet is about 35 times the distance the Earth is from the Sun at the farthest part of its orbit. I wonder if comets can accretize or add gases to their masses when they are out beyond the planets or do they just get old? “Accretion refers to the collision and sticking of cooled microscopic dust and ice particles electrostatically, in protoplanetary discs and gas giant protoplanet systems, eventually leading to planetesimals which gravitationally accrete more small particles and other planetesimals.” The planets are on far more circular orbits around the Sun than comets. So the three celestial objects mention above (Asteroid DA-14, Comet ISON and Comet PanSTARRS) were all discovered recently. Is this because of vastly improved telescopic capabilities? Most definitely! But is it possible that something else is going on here? To my knowledge it is fairly unusual for there to be two visible to the naked eye comets in the space of one year. In 2012 in the Southern Hemisphere Comet Garradd was visible and in 2011 Comet Lovejoy. Comet Elinen turned out to be a big disappointment in 2011 and did not produce the expected coma or tail. Comets are extremely unpredictable as to how bright they will be because it is unknown how much of the trapped gases within a comet will be released when they come closest to the sun. Apparently there is another comet visible in the Southern Hemisphere this year, the Comet Lemmon, a green comet. What if (this is pure speculation) our Solar System is moving through an area of the galaxy which has more than the usual amount of debris (rocks and icy particles= asteroids and comets)? Currently most of the larger known asteroids orbit the Sun in an area between Mars and Jupiter and all of the periodic comets have those elliptical orbits which take them out beyond the planets into the Kuiper Belt. If our Solar System is moving into a more densely populated area of the galaxy does that put Earth in a greater danger of collision? In my entire life I have only seen two visible to the naked eye comets and if both ISON and PanSTARRS put on a show this year that will be quite unusual. Last year I was privileged to see a fireball in the beginning of March and then became much more aware of the fireball phenomena, a small asteroid that comes into the Earth’s atmosphere but bigger and slower than the common shooting star which might be an object the size of a grain of sand. The other issue about comets I’d like to touch upon here is a confluence of science and folklore. In a previous post I mentioned the theory of panspermia. It was there noted that a heat analysis of the dust from Halley’s comet “matched that of bacteria and nothing else”. Viruses and bacteria, particularly anaerobic bacteria, can live in space. The appearance of comets in the heavens has been linked throughout history with plagues and extinctions on Earth. Most notable are the appearance and partial break-up of Encke’s Comet in 1910 (closest approach to Earth October 27 1914) and the Pandemic Spanish Influenza of 1917 through 1919. It seems the Earth went through the dust cloud left by Encke’s Comet. I’d like to recommend the excellent and thorough article on this subject by Rhawn Joseph, Ph.D., and Chandra Wickramasinghe, Ph.D. in the Journal of Cosmology. So can we expect to be hit with more space rocks and ice? And is there a plague on the way? Of course, the answer is yes and yes, but when is the better question. 02/22/13 Watch this! http://vimeo.com/59571509 PanStarrs and Lemmon in the Southern Hemisphere. PanSTARRS is coming up to the Northern Hemisphere in March. 04/21/13 Update: A few weeks ago Kate Valentine had Neil deGrasse Tyson on her UFO Show. She read a question from me asking him if it were possible, in view of the increasing number of so-called “February fireballs”, that we were moving into a more active part of the galaxy. He answered in the affirmative. Today, Facebook friend, Andrew Ackerley, brought this Argentinian video to my attention: http://www.youtube.com/watch?client=mv-google&gl=DK&hl=en&v=nTdbROLB5pQ&nomobile=1 Clearly we seem to be seeing more of these things. Or are we just more aware? You be the judge.